His supporters are, as yet, anything but socialist zealots—and that’s gonna be a problem. In presentational terms, Corbyn’s initial six weeks have been mostly unimpressive. His victory took even him by surprise, and Corbyn lacked the infrastructure to capitalize on it. The establishment media were always going to be hostile: Among other things, he campaigned on a platform of leaving NATO, boycotting Israeli universities, and raising taxes on the rich. But a series of unprovoked gaffes, unnecessary U-turns, and incoherent messages have given his media critics material they do not deserve. In Britain, at least, this leftward shift is more sharply defined by what it leaves out than what it embraces. Fortunately, Corbyn is the least interesting element in this whole episode. However unlikely his win in local terms—Labour’s left parliamentarians were of two minds about putting up a candidate at all, and he was their fourth choice—it fits a global pattern. In much of Western Europe, including Greece, Spain, and now Portugal, the hard left is on the rise. This is where the nascent social movements, from Occupy Wall Street to pro-immigration and anti-racism activists, have found an electoral home. (Sanders’s ascent in the United States suggests a similar trajectory, albeit in a very different political culture.) After almost a decade and a half of war, crisis, and austerity, this revival poses a challenge to the neoliberal consensus, which had effectively banished certain policy agendas—nationalization, nuclear disarmament, increased social spending—from the public square. The absence of such debates left social-democratic parties, whether in power or in opposition, struggling to formulate a credible response to austerity—one that would leave them electorally viable without alienating their core supporters and clobbering those whose interests they claim to represent. What is different about Britain is that, with the exception of Scotland—which, for various reasons, has its own dynamic—the left here has not decoupled from the center. So while the agenda that Corbyn espouses is similar to that of Syriza in Greece, Podemos in Spain, Die Linke in Germany, and the Parti de Gauche in France, it is embedded in the mainstream rather than the expanding margins. This has energized a party that, following a surprise defeat in May, found itself existentially challenged and in a state of profound despondency. 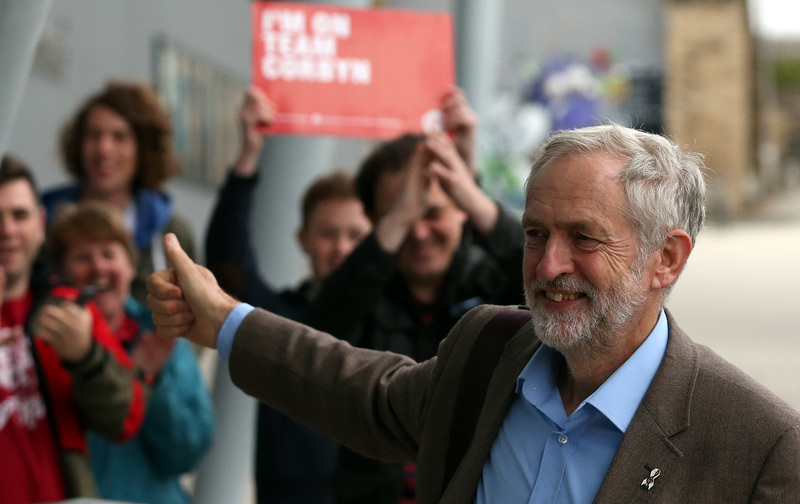 Within five days of Corbyn’s victory, Labour had acquired 40,000 new members. Within 24 hours of his conference speech as leader, during which he promised a “kinder, more caring politics,” another 2,000 people had signed up. In the areas where Labour needs to win the next election, party branches have grown by as much as 50 percent (admittedly from fairly low numbers). There are enough dialectical conundrums here—between the local and the global, the electoral and the political, the base and the superstructure—to keep a Marxist theoretician going until the barricades are up. But two challenges stand out for now. First, in Britain at least, this leftward shift is more sharply defined by what it leaves out than what it embraces. Corbyn’s decisive victory—in a field of four, he won half the votes—delivered a stake to the heart of Blairism: The Labour vote’s clear rejection of triangulation, centrism, and the managerial antipathy to idealism that came with it is what makes this moment transformational. There is no going back; whatever comes next will be fundamentally different from what preceded it. But it’s not yet clear what that next phase will be. The ideological underpinnings of Corbyn’s base are unclear. His detractors brand those who voted for him as “zealots,” but for the most part they are anything but. Their disillusionment with the path that Labour had been taking has not crystallized into any kind of consensus on an alternative. Talking to Corbyn voters, one senses a weak attachment to much of his agenda. Second, while the standard-bearers of Europe’s rising left have leveraged the electoral appeal of the struggle against neoliberal globalization, they have yet to find a way to effectively challenge it in government. Syriza, in Greece, offers the clearest example: After standing on an anti-austerity platform, winning the election, and putting its negotiating position to the test in a referendum, Syriza was forced to buckle when confronted by the might of the European Union leadership. The party was later reelected with a far more modest program. An analogous scenario may yet play out in Portugal, where hard-left, euroskeptic parties performed well in October’s election. With the center-left poised to come to an arrangement, the president suggested everything should be done to deny them power. “Never in 40 years of democracy have the governments in Portugal relied on the support of anti-European political forces,” he said. Each case, in its own way, has demonstrated both the potential of electoral engagement and the limits of democratic control. This stands less as a criticism than a critique. The left has finally developed the strategic skills to gain office; it has yet to work out how to exercise power in the interests of those who put it there.